Registering UnityJDBC as a JDBC source in Rapid SQL® allows users to create a virtual data view that has multiple data sources on different servers and platforms and use SQL queries to join, compare, analyze, and move data between systems. Cross-database queries can be used in any reporting or analytic software allowing access to multiple databases simultaneously. 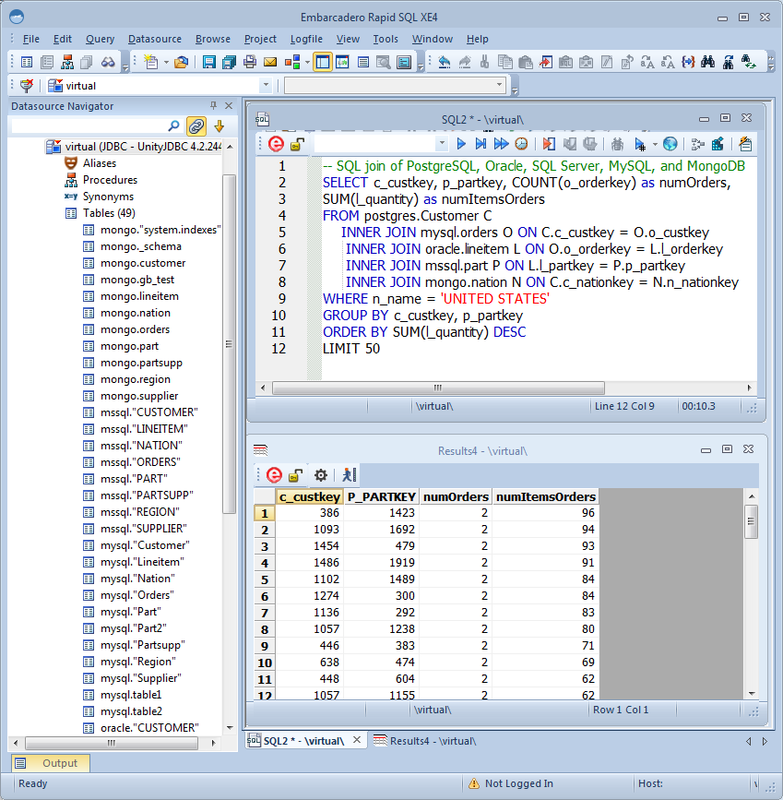 UnityJDBC allows Rapid SQL to support cross-database joins and SQL queries similar to Dell's Toad™ products. No costly server infrastructure changes are required. Virtualization is done in minutes and can be used in other reporting and business software. UnityJDBC will translate SQL dialects for different databases automatically and perform SQL functions and syntax internally when not supported by the database. Create data sources using the UnityJDBC source builder. Register the UnityJDBC driver in Rapid SQL and query any number of sources using standard SQL. Can your query software join data from five databases (Oracle, MySQL, SQL Server, PostgreSQL, MongoDB) with one query? Rapid SQL® using the UnityJDBC driver allows distributed, federated, and virtualized SQL queries in seconds.